Gomersal's Richard Wear is bowled during last Saturday's Championship One game against Bowling Old Lane. 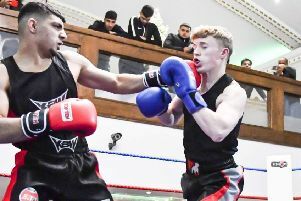 Scholes suffered an agonising one-run defeat at the hands of Morley on a dramatic day at the top of All Rounder Bradford League Championship One. Wrenthorpe revived their promotion challenge with a two-wicket win over leaders Methley. With three games remaining, Methley have 302 points and lead by three from Scholes with Wrenthorpe a further 17 back. Morley stunned Scholes by managing to defend a meagre total of 127. Luke Heinemann (36) and Sangeeth Cooray (33) led the way for Morley as James Stansfield (3-23) and Gareth Lee (3-32) found conditions to their liking. After paceman Matthew Dowse (3-43) had claimed the first three wickets, captain Ollie Halliday took 4-26 and sealed his side’s dramatic win when he trapped Ryan Robinson lbw with Scholes one run short of the Morley total. Scholes play their final home game of the season against Ossett on Saturday before facing trips to promotion rivals Wrenthorpe and Methley in their final two games. Wrenthorpe bowlers Jonathan Rudge (3-32) and Chris Leaf (2-39) helped restrict Methley to 194-8, with Ashton Blakey (55) and Eddie Walmsley (46) leading the way. Opener Jordan Sleighthome led the Wrenthorpe run chase with 47 and was backed up by James Glynn (38) as they eased home with two overs to spare. Sohail Raz (3-31) and Marcus Walmsley (3-52) were the best of the Methley bowlers. Birstall are now 38 points adrift at the foot of the table after suffering a two-wicket defeat to Bankfoot. Captain Jimmy Lee took 3-40 as Birstall were dismissed for 127, despite Eric Austin top scoring with 37. Bankfoot were in trouble when Saif ur Rehman (6-43) reduced them to 60-7, but Jawad Waheed (49) struck four sixes and five fours, while Lee made 35 to edge his side to victory, which leaves them 16 points clear of second-bottom side Bowling Old Lane. Old Lane boosted their hopes with a five-wicket win over Gomersal. Zeeshan Haider claimed 6-27 and was well supported by Haroon Tariq (3-36) as Gomersal were bowled out for 143. Captain Graham Hilton (44), Nick Whitehill (31) and Joe Duffy (30) led the way for Gomersal. Old Lane opener Farakh Hussain blasted an unbeaten 81 to seal victory despite Joel Pollard taking 4-54 for Gomersal. Undercliffe overseas player Anas Mahmood made his first century for the club in their 189-run win over Ossett. Mahmood hit three sixes and 12 fours in his 113 and was joined in a second-wicket stand of 101 by Scott Etherington (41). Gulsheraz Ahmed (44) and Toby Thorpe (38) helped boost the Undercliffe total to 299-8 with John Sadler claiming 3-60. Gavin Goodlad (32) top scored as Ossett were bowled out for 110 to lose by 189 runs as Michael Kelsey picked up 5-22. Simon Bailey hit his second century of the season as Baildon chased down Yeadon’s score of 198-7 with three balls to spare. Bailey’s 109 not out contained four sixes and 10 fours as his side recover from 23-3. Darren Wilson (42no) shared an unbroken sixth-wicket stand of 123 with Bailey.